You’re right of course. Didn’t think it through. I think I know what you mean by “the appearance of an ease.” I will pay attention to that next time, see if I can do better. I’ll report back after our next sail. A few days. Last edited by hpeer; 2 Weeks Ago at 08:26 PM. If it is any consolation, I first thought "hey, I forget to mention the Cunningham." before I had my "never mind" moment. 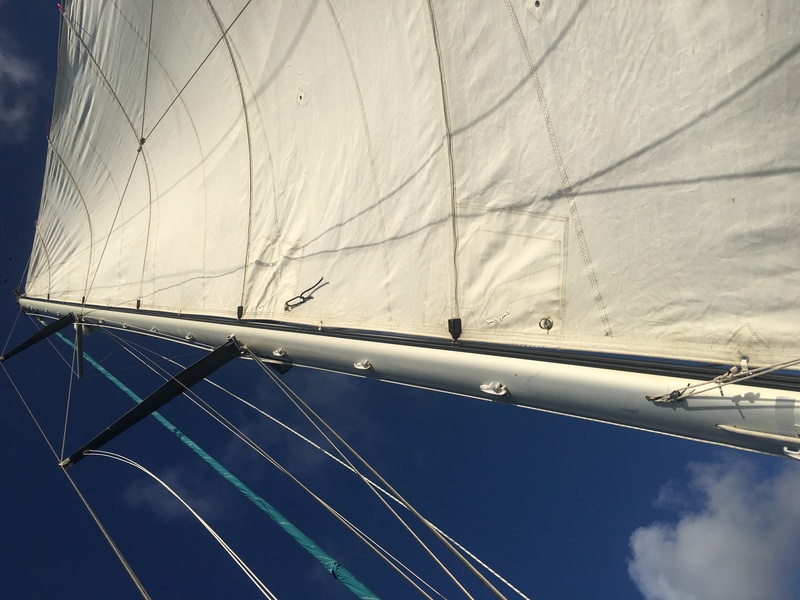 More twist on the main would help with the jib reefed, hard to do without a traveler, or as mentioned with Vang eased traveller (or other means) pulled higher sheet eased, will let the head twist off. The air up there is not doing the same thing the air down here is. Cunnungham moves the draft forward, doesn't look like that would hurt. Usually done as a small depower before reefing, depends on where you usually reef, all Boats are different. My Boat likes to be reefed sooner than I do it, usually. The simplest most effective main sheel I ever used was a triangle, only one sheet. Had its drawbacks but you couldn't pull it so tight (without a winch) to stall the head, but it couldn't be pulled up to center to get truly close hauled. I fussed with the sail today on anchor. I got the sail to the top of the mast and I was lifting the boom a good bit. I was doing the right things but in the wrong sequence. Here is the sail now. At anchor, no tension on the main sheet, about 15 knots. To me it looks better already. I messed with the sail as Jeff suggested. Jeff, your suggestions made perfect sense and I now feel stupid for coming to them on my own. Brain got stuck in some repetitive rut!! I also added some low friction rings to the cringle s, makes setting reef foot tension much easier. I’ve only a couple of trips with her now but there is a marked improvement in her speed and Windward progress. I also need to adjust when I rest, make it sooner. St Vincent to Bequai the other day, 15 - 20 apparent in both owe reach to 60° on the wind, and I had to really deposed the sail a LOT to keep her in her feet. Doing about 6-1/2 knots, which is pretty good for 40,000# on 37 LWLi think. I would have putnin a second reef if it were not such a short trip. I’m now seriously considering having a third reef point added this summer during layup. Easy to see how it could be real useful. Thanks to all for the help, got me out of my stupor. The learning goes on. I am glad to hear that it worked out for you.